The aim of this study was to develop and validate a multivariate calibration method based on partial least squares (PLS) and near infrared spectroscopy for determining the interfacial tension of insulating oils used in electricity power transformers. Forty-eighty oil samples were obtained from an electricity power company and were divided into a calibration set of 38 leaving 10 for the validation set. The reference values were measured with a ring tensiometer and ranged from 15 dyn cm−1 to 45 dyn cm−1. 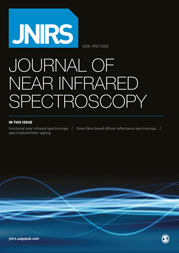 The spectra were registered from 1280 nm to 2500 nm and the best PLS model was selected with 10 latent variables, providing a root mean square error of prediction of 2 dyn cm−1 and a coefficient of determination between reference and predicted values of 0.962. This method was validated in the context of multivariate calibration and was considered to have adequate accuracy (prediction errors between −9% and 12%), precision and linearity. A bias test verified the absence of systematic errors in the model. A pseudo-univariate calibration curve was constructed based on the concept of net analyte signal. The proposed method was simple, rapid, non-destructive and considered appropriate for the routine use in a quality control laboratory of an electricity power company.